1) WHAT TYPE OF FORMATS CAN I SEND YOU? 2) WHAT COLOR MODE SHOULD MY FILE BE? 3) WHAT RESOLUTIONS SHOULD MY FILE BE? A: No, you cannot change a low resolution to be high resolution in graphic design. There is no way to add pixels to a low resolution image. ​​High resolution is 300 dpi (dots per inch), whereas low resolution pictures are less than 300 dpi. Images that are in high resolution provide a clearer picture, due to the concentrated and tight combination of dots per inch. Conversely, you’ll notice dots more on a low resolution image and the picture won’t be as clear. 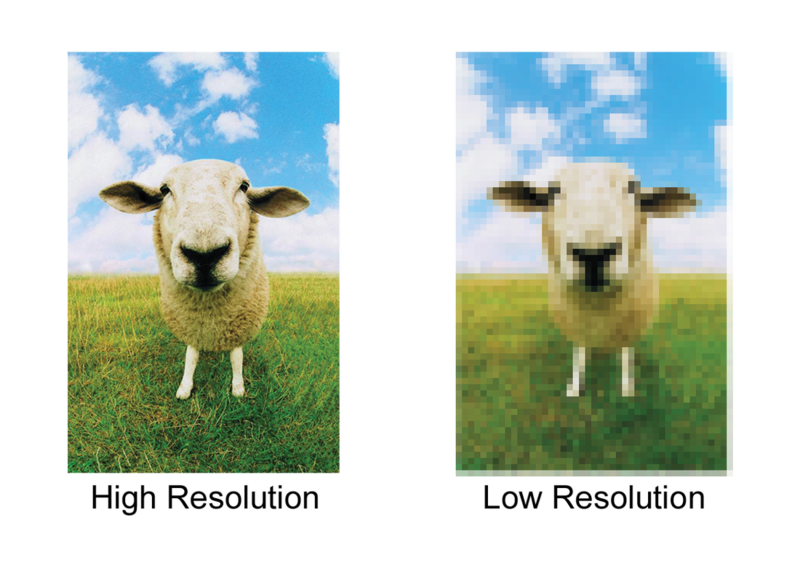 In graphic design, low resolution images are going to look pixelated, blurry and not as clear-cut as high resolution images. High resolution images are needed for print design in order to produce crisp, clear images. 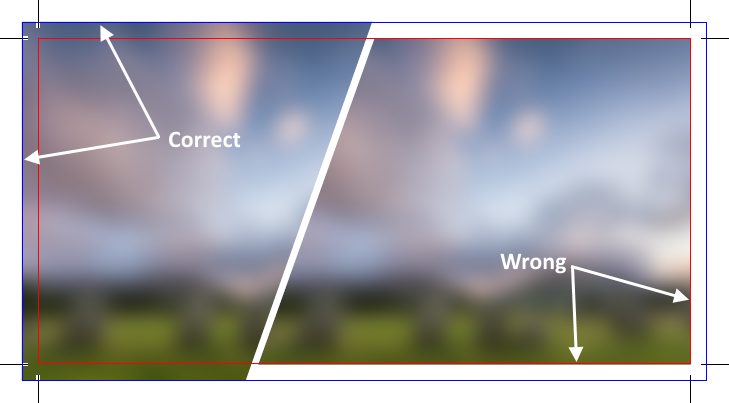 Lower resolution images can be used for websites and social media. 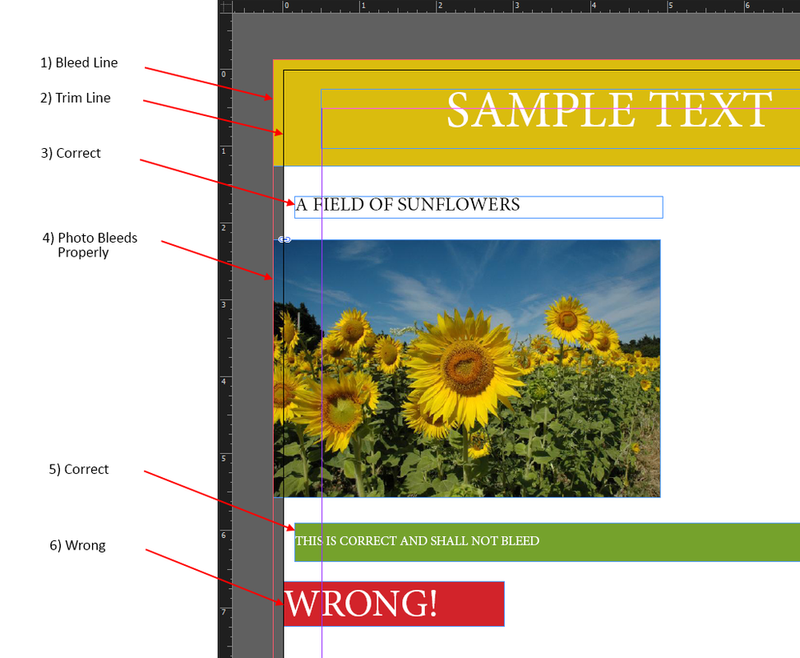 Bleed Line – the red bleed line indicates where your photos, illustrations, and objects must extend to in order for your document to have proper bleeds. In this case, the mustard colored box at the top must extend to the left, top, and right (not shown) bleed line. Trim Line – the black trim line indicates where the document’s final cut will be, and this will be the edge of your finished piece. Correct Placement of Text – be sure to place text (and other objects) that you don’t want to bleed at least 1/8″ inside the trim line to avoid the possibility of these elements from being unintentionally clipped during cutting. Photos that Bleed – extend photos beyond the trim line and all the way to the bleed line. Non-Bleeding Object – Once again, be sure to place text (and other objects) that you don’t want to bleed at least 1/8″ inside the trim line to avoid the possibility of these elements from being unintentionally clipped during cutting. Improperly Bleeding Object – DO NOT place objects right up against the trim line. These objects will most likely not bleed or will be clipped during cutting. This is the opposite of a proper bleed setup! MORE INFO. COMING SOON PLEASE SEND US A MESSAGE IF YOU HAVE ANY QUESTIONS.